964M Alpha Adult Gray Male 5 2014 Since 966M's death, 964M may be the new alpha male. Gray yearling Subordinate Adult Gray Female 3 Uninfected 2016 This light gray pup wanders with 1047M and is occasionally seen with Prospect Peak. No ID yet Adult Gray Unknown 2 Uninfected 2017 Prospect Peak Pack Born in the natal den at Slough Creek. 763M Subordinate Unknown Black Male 11 Uninfected 2008 SW763M (collared by Montana Fish, Wildlife, & Parks) was a former 8-Mile wolf. Has a GPS collar and a very gray body and face. In early 2017, he joined the Junction Butte pack from Prospect Peak. 821F Alpha Unknown Gray Female 10 Uninfected 2009 2017 Studded collar. This alpha female was killed by other wolves in April 2017 soon after she had given birth. 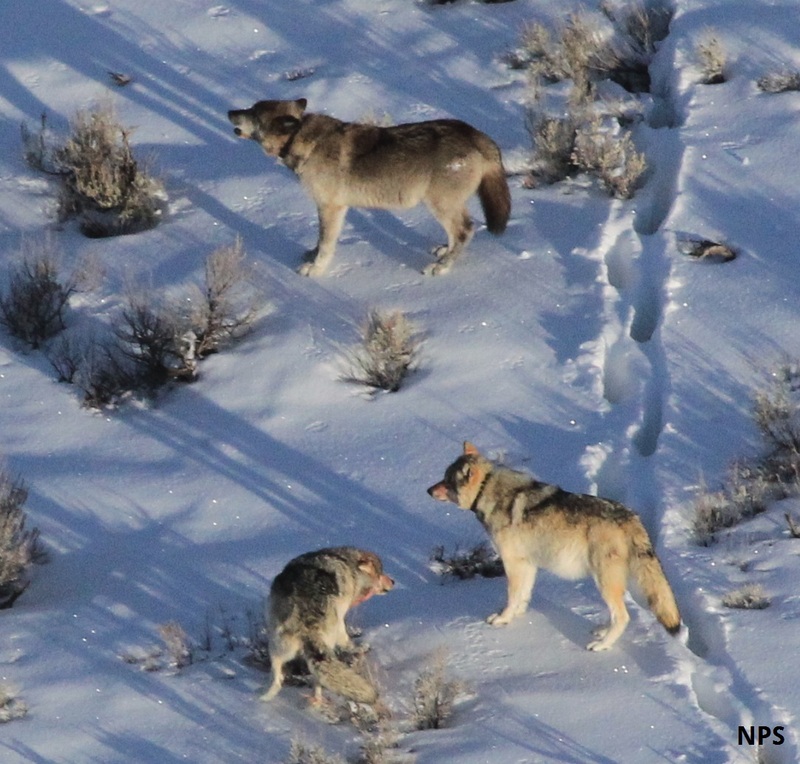 996M Subordinate Unknown Black Male 4 Uninfected 2015 Prospect Peak Pack Originally a Prospect Peak wolf, he joined Junction Butte in March 2017. His collar is not functional.